Guidecraft Complete Kitchen Center Review & Giveaway! Win a new Complete Kitchen Center from Guidecraft (ARV $370)! This compact Kitchen Center features 5 major appliances in one attractive play island. Complete with stove, oven, microwave, sink, and dishwasher with removable plate rack. 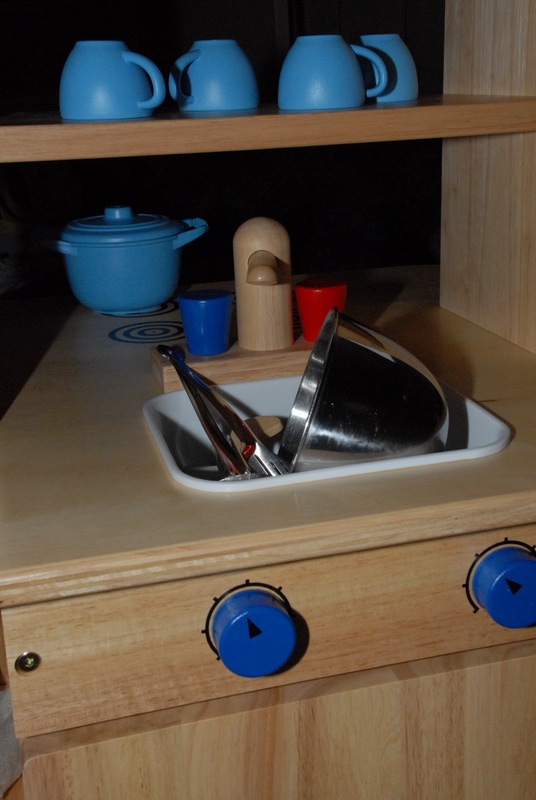 Ergonomically kid-friendly counter-top provides food prep and dish washing area. Features turning knobs, silk-screened controls, acrylic windows on appliance doors, write-on wipe-off board, and wooden shelves for loads of storage. 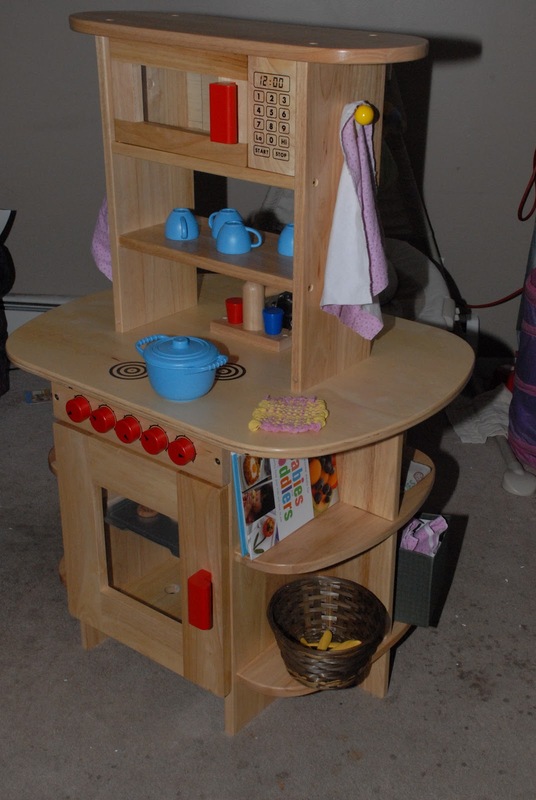 This is a FANTASTIC play kitchen that will become an heirloom toy in your family! The materials are very high quality and I was impressed by not only the strength of the wood it’s made with, but the beauty of it as you can see the grain patterns. 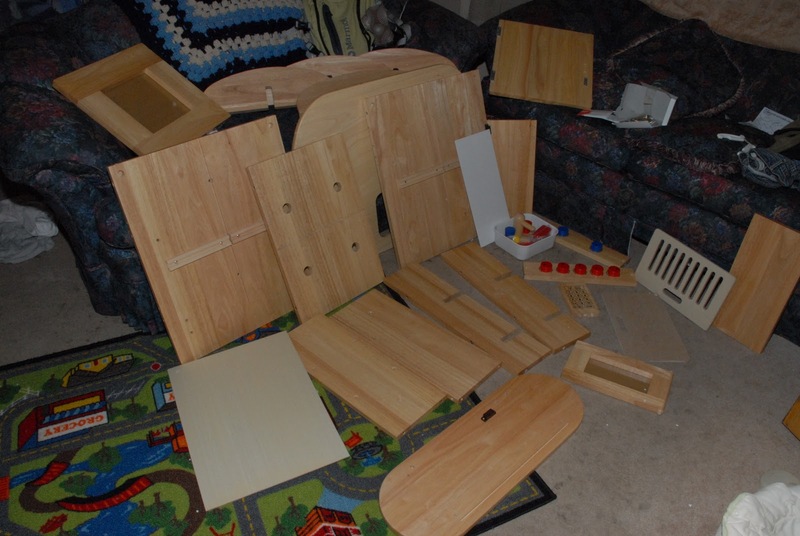 Once assembled, everything sits snugly and is balanced so you don’t need to worry about your child tipping it over. 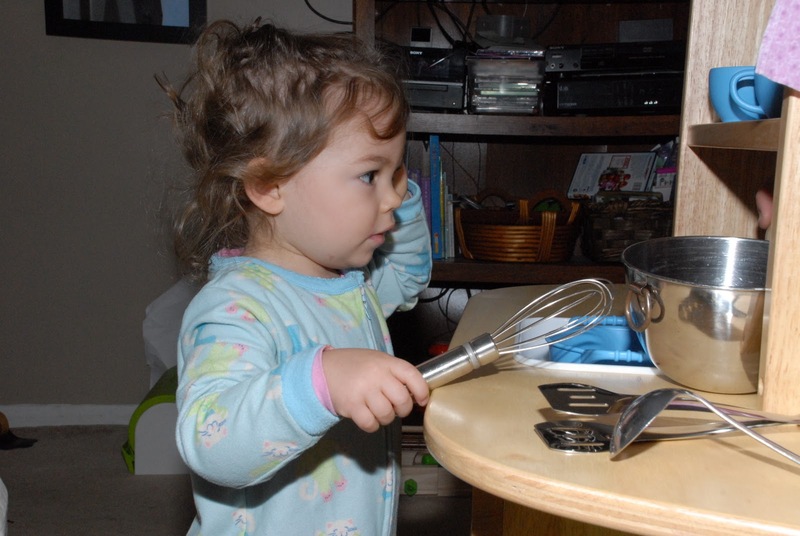 The benefits of a child having a play kitchen are so many as it helps develop social skills, problem solving, organizing, large and small motor skills, and even verbal communications if you facilitate it. Since the colors and style of this kitchen are clearly gender neutral, I think it’s an excellent choice for any family! The only downside I found to this was that the directions were a bit tricky. It took me 2.5 hours to assemble this and I had to elicit the help of my carpenter husband to help me out. :-\ Granted, this was done very late at night and I was watching TV while I put it together, so you could probably get it down to 2 hours if you were snappy about it and didn’t have to waste time figuring out how to do certain things. 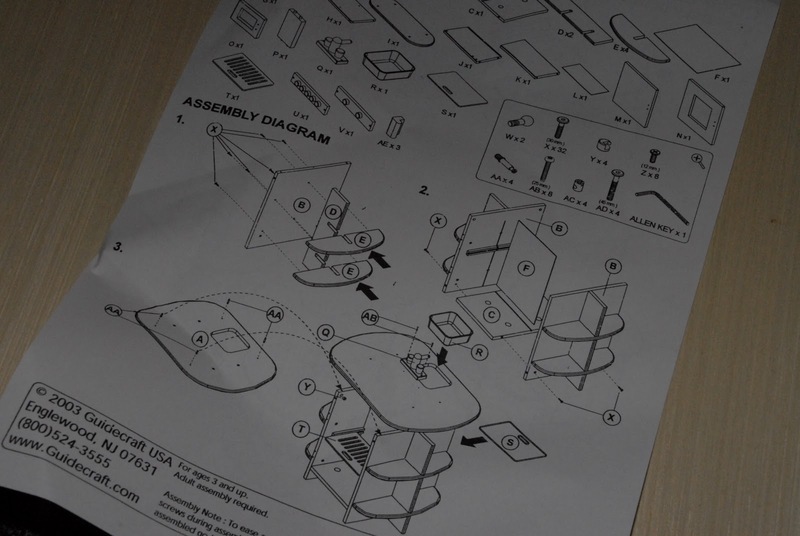 The directions are only picture ones, which is actually faster for me than deciphering written ones. HOWEVER. The directions fail to mention that you need a philips’ head screw driver (not included) and also fail to mention how to use certain hardware pieces (and I don’t know what these pieces are called, so you’ll just have to take my word on it that I would have not ever figured it out unless my husband had already known how to use these things). The tricky part is Step 3. What you need to do is take the screw and screw the bottom part of it into the “holes” of the counter bottom using the phillips’ head. 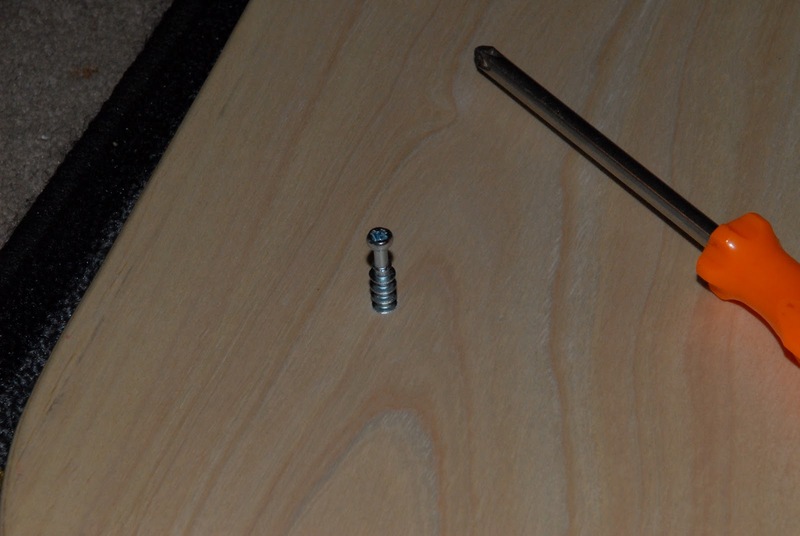 Only screw in until the threads change thickness. 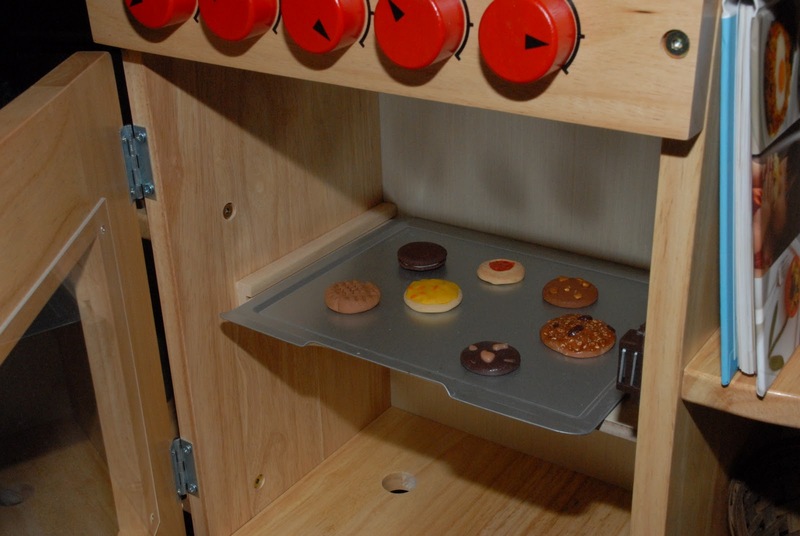 Then you place the round thing-a-ma-jigs into the holes in the kitchen base’s side and lay the countertop down on top. The screws will then end up sitting in the round thing-a-ma-jigs which you need to turn clockwise to lock down the counter top. I thought I had done this (after being told how to), but my husband’s strength was needed to really get it locked down. Once everything was said and done though, the kitchen looked awesome and I am not at all worried about it going anywhere. We gave this to LoveBug for her second birthday (October 31!). It definitely passed the toddler-test. She kept saying “woah! WOAH!” while opening it (wide eyed and with a smile)…and then she couldn’t wait any longer to play, so she ducked herself under the remaining wrapping paper so she could get to the fun. It’s been a whole 28.5 hours now and she hasn’t stopped playing with it except to sleep! Can it get any more fun than the Guidecraft Complete Kitchen Center?! Buy It! 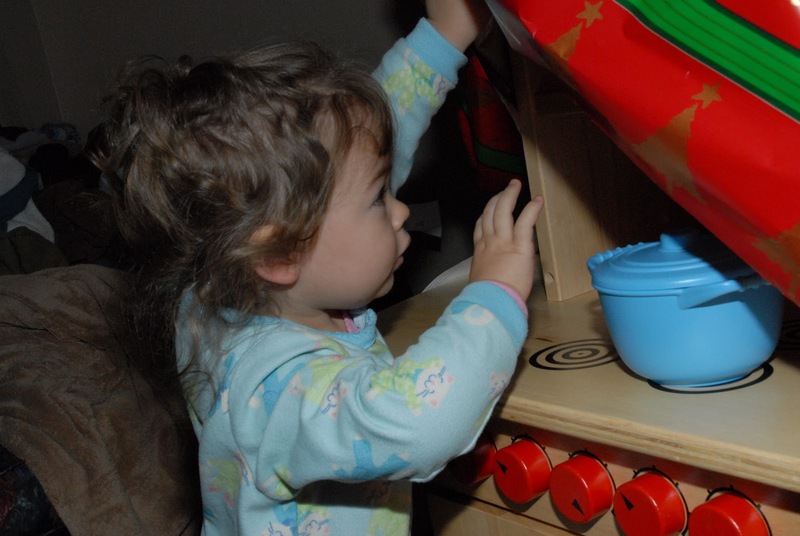 Give your child the gift of learning through play by snagging one of these kitchens at Guidecraft’s website (www.Guidecraft.com) for $370 or at Amazon for $277.99 (best price I found while writing this post). Win It! *You MUST be publicly following this blog in order to win. Just click the “Follow (with Google Friend Connect)” button in the far right hand column near the top of this page. Problems? Send me an email and I’ll help you out! lifemoresimply@yahoo.com. * Contest ends 12/1/10 at noon, EST. To win, leave me a comment below telling me one other toy you would LOVE to have from Guidecraft! Be sure to include your email address in EVERY entry and leave a separate comment for each entry as well. 1) Tell me WHY you want to win this. 6) After you’ve “liked”/”friended” Life More Simply on Facebook, put this as your status: “I’m hoping to win the Complete Play Kitchen Center from Guidecraft for Christmas ($370!!!!) at http://tinyurl.com/WinGuidecraft ! @Life More Simply” (my name will come up in BLUE if you did it right). 1 entry/day. 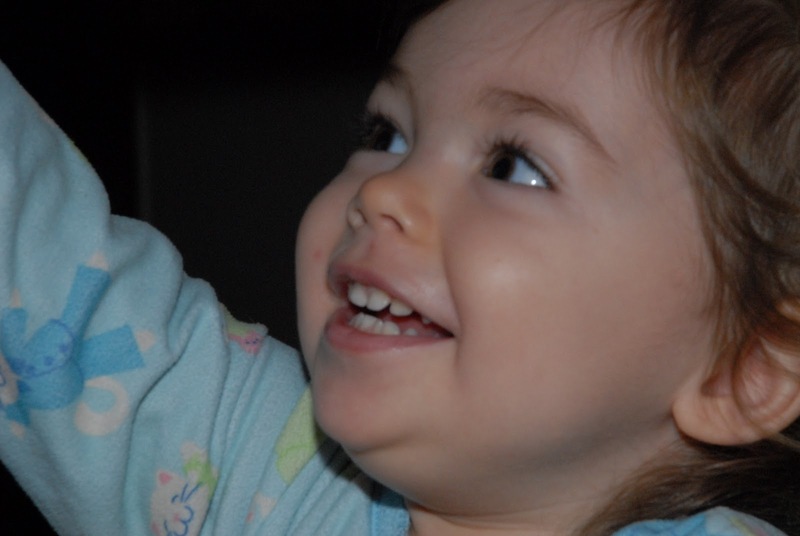 9) Spread the word on a parenting forum, message board, or any other way and tell me how you did it with a link! Bubbles Couture Diaper Review & Giveaway! I also would love the Guidecraft Pastel Dress-up Carousel. would also love the see and store dress up center!